Mayor Rahm Emanuel today joined the Chicago Department of Transportation (CDOT) and the Chicago Parks District to break ground on construction that continues on the Navy Pier Flyover Project, a 2,200 foot structure that will connect the two halves of Chicago’s Lakefront Trail and help separate pedestrians and bicyclists from cars crossing at Illinois and Grand Street. The project will improve safety and eliminate two major bottlenecks on Chicago’s signature lakefront recreational trail, which is used by thousands of people each day during busy summer weekends. The most recent project consists of a new 16-foot wide multipurpose bridge from just north of Ogden Slip to the north end of the Chicago River Bridge. 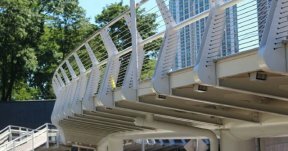 The 807 foot segment will run alongside lower Lake Shore Drive and over DuSable Park. This will deliver a usable segment of the Flyover, carrying pedestrians and bicycle riders over Illinois and Grand Streets, when it reaches substantial completion by the end of 2018. The Park District is also in the midst the Lakefront Trail Separation, a major project to designed to alleviate areas of congestion by creating two distinct paths: a bike trail and a separate pedestrian trail for those on foot. Initial funding was provided by the Chicago Park District. Completion of the project was made possible through a donation from Ken Griffin, Founder and Chief Executive Officer of Citadel. Chicago’s entire 18-mile Lakefront Trail, which runs from Ardmore Avenue on the north to 71st Street on the south, will be separated for cyclists and pedestrian. Completion is expected in 2018. 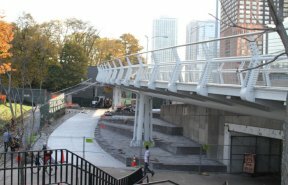 Additional construction work on the Navy Pier Flyover is expected to begin in spring of 2018, with the Lakefront Trail portion expected to be completed within the first 12 months. Funding for the project is coming from federal and state sources. In order to get the project completed within existing resources, the construction schedule has been spread over several years.